Lothal is one of the most prominent cities of the ancient Indus valley civilization. Located in Bhāl region of the modern state of Gujarāt and dating from 2400 BCE. Discovered in 1954, Lothal was excavated from 13 February 1955 to 19 May 1960 by Prof. S.R. Rao of the Archaeological Survey of India (ASI), the official Indian government agency for the preservation of ancient monuments. 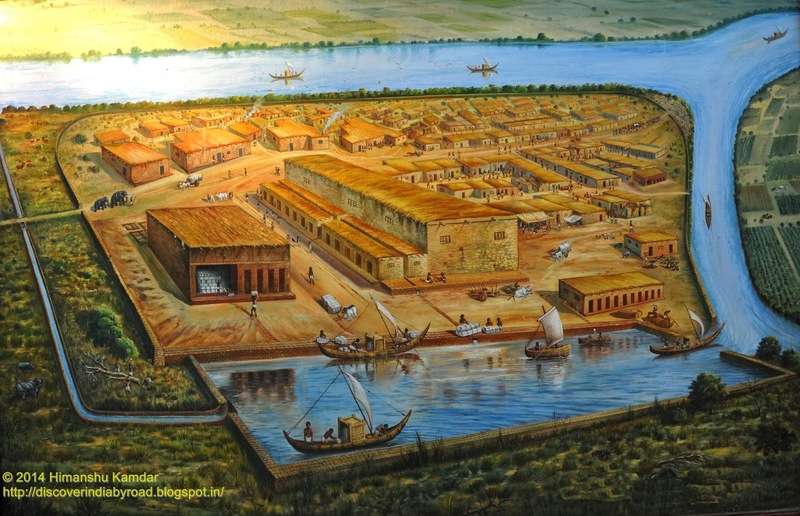 Lothal's dock—the world's earliest known, connected the city to an ancient course of the Sabarmati river on the trade route between Harappan cities in Sindh and the peninsula of Saurashtra when the surrounding Kutch desert of today was a part of the Arabian Sea. It was a vital and thriving trade centre in ancient times, with its trade of beads, gems and valuable ornaments reaching the far corners of West Asia and Africa. The techniques and tools they pioneered for bead-making and in metallurgy have stood the test of time for over 4000 years. The meaning of Lothal (a combination of Loth and (s) thal) in Gujarati to be "the mound of the dead" is not unusual, as the name of the city of Mohenjo-daro in Sindhi means the same. People in villages neighbouring to Lothal had known of the presence of an ancient town and human remains. Lothal is situated near the village of Saragwala in the Dholka Taluka of Ahmedabad district. It is six kilometres (south-east) of the Lothal-Bhurkhi railway station on the Ahmedabad-Bhavnagar railway line. It is also connected by all-weather roads to the cities of Ahmedabad (85 km/53 mi), Bhavnagar, Rajkot and Dholka. The nearest cities are Dholka and Bagodara. Ahmedabad is the nearest Airpot. If you Plan to Visit Lothal, you must travel by your own or Private Vehicle. No Food Facility is Available nearby site, so carry your food with you. Basic Amenities like Water & Toilet are Available at Museum site. Avoid visit during mid afternoon, as heavy sun will bother you for Proper site visit. The dockyard was located away from the main current to avoid deposition of silt. Modern oceanographers have observed that the Harappans must have possessed great knowledge relating to tides in order to build such a dock on the ever-shifting course of the Sabarmati, as well as exempl aryhydrography and maritime engineering. This was the earliest known dock found in the world, equipped to berth and service ships. It is speculated that Lothal engineers studied tidal movements, and their effects on brick-built structures, since the walls are of kiln-burnt bricks. This knowledge also enabled them to select Lothal's location in the first place, as the Gulf of Khambhat has the highest tidal amplitude and ships can be sluiced through flow tides in the river estuary. The engineers built a trapezoidal structure, with north-south arms of average 21.8 metres (71.5 ft), and east-west arms of 37 metres (121 ft). Another assessment is that the basin could have served as an irrigation tank, for the estimated original dimensions of the "dock" are not large enough, by modern standards, to house ships and conduct much traffic. The original height of the embankments was 4.26 metres (13.98 ft). (Now it is 3.35 metres (10.99 ft).) The main inlet is 12.8 metres (42.0 ft) wide, and another is provided on the opposite side. To counter the thrust of water, offsets were provided on the outer wall faces. When the river changed its course in 2000 BCE, a smaller inlet, 7 metres (23 ft) wide was made in the longer arm, connected to the river by a 2 kilometre (3.2 mi) channel. At high tide a flow of 2.1–2.4 metres (6.9–7.9 ft) of water would have allowed ships to enter. Provision was made for the escape of excess water through the outlet channel, 96.5 metres (317 ft) wide and 1.7 metres (5.6 ft) high in the southern arm. The dock also possessed a lock-gate system—a wooden door could be lowered at the mouth of the outlet to retain a minimum column of water in the basin so as to ensure floatation at low tides. Central to the city's economy, the warehouse was originally built on sixty-four cubical blocks, 3.6 metres (11.8 ft) square, with 1.2-metre (3.9-ft) passages, and based on a 3.5-metre-high (11.5 ft) mud-brick podium. The pedestal was very high to provide maximum protection from floods. Brick-paved passages between blocks served as vents, and a direct ramp led to the dock to facilitate loading. The warehouse was located close to the acropolis, to allow tight supervision by ruling authorities. Despite elaborate precautions, the major floods that brought the city's decline destroyed all but twelve blocks, which became the makeshift storehouse. Lothal's acropolis was the town centre, its political and commercial heart, measuring 127.4 metres (418 ft) east-to-west by 60.9 metres (200 ft) north-to-south. There were three streets and two lanes running east-west, and two streets running north-south. The four sides of the rectangular platform on which houses were built are formed by mud-brick structures of 12.2–24.4 metre (40–80 ft) thickness and 2.1–3.6 metres (6.9–11.8 ft) high. The baths were primarily located in the acropolis—mostly two-roomed houses with open courtyards. The bricks used for paving baths were polished to prevent seepage. The pavements were lime-plastered and edges were wainscoted (wooden panels) by thin walls. The ruler's residence is 43.92 square metres (472.8 sq ft) in area with a 1.8-square-meter-bath (19 sq ft) equipped with an outlet and inlet. The remains of this house give evidence to a sophisticated drainage system. The Lower town marketplace was on the main north-south street 6–8 metres (20–26 ft) wide. Built in straight rows on either side of the street are residences and workshops, although brick-built drains and early period housing has disappeared. The street maintained a uniform width and did not undergo encroachment during the reconstructive periods after deluges. There are multiple two-roomed shops and workplaces of copper smiths and blacksmiths. Lothal planners engaged themselves to protect the area from consistent floods. The town was divided into blocks of 1–2-metre-high (3–6 ft) platforms of sun-dried bricks, each serving 20–30 houses of thick mud and brick walls. The city was divided into a citadel, or acropolis and a lower town. The rulers of the town lived in the acropolis, which featured paved baths, underground and surface drains (built of kiln-fired bricks) and a potable water well. The lower town was subdivided into two sectors. A north-south arterial street was the main commercial area. It was flanked by shops of rich and ordinary merchants and craftsmen. The residential area was located to either side of the marketplace. The lower town was also periodically enlarged during Lothal's years of prosperity. The bead factory, which performs a very important economic function, possesses a central courtyard and eleven rooms, a store and a guardhouse. There is a cinder dump, as well as a double-chambered circular kiln, with stoke-holes for fuel supply. Four flues are connected with each other, the upper chamber and the stoke hold. The mud plaster of the floors and walls are vitrified owing to intense heat during work. The remnants of raw materials such as reed, cow dung, sawdust and agate are found, giving archaeologists hints of how the kiln was operated. 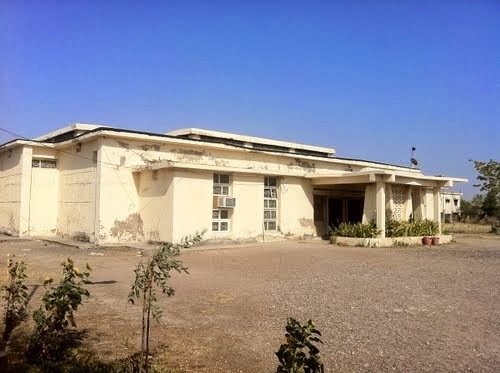 A large mud-brick building faces the factory, and its significance is noted by its plan. Four large rooms and a hall, with an overall measurement of 17.1 × 12.8 metres (56 × 42 ft). The hall has a large doorway and a raised floor in the southern corner of the building. The museum was setup in 1976 in order to display the artifacts recovered from the excavation conducted from 1952 to 1961. The Museum has three galleries. In the front gallery depicts an artist’s conjectural idea of Harappan town of Lothal. There are also introductory write-ups and maps about the site. The gallery at left side has showcases with beads, terracotta ornaments, replicas of seal and sealings, shell and ivory objects, copper and bronze objects, tools and potteries yielded from excavations. The gallery at right has game objects animal and human figurines, weights, painted potteries, objects recovered from burials and ritual objects, miniature potteries, bricks besides a replica of a joint burial and a scaled model of Lothal site. Out of the 5089 objects unearthed during the excavation, 800 objects are on display in the museum. Apart from the exhibited antiquities, the most fabulous antiquities of Lothal are beads, steatite seals with unicorn motif and inscription, terracotta sealing with an elephant motif, Persian Gulf type seal, gold necklace copper / bronze fish hooks, bangles, dish on stand, perforated jar, jar painted with the stories of thirsty crow and cunning fox, terracotta bull, horse, model boat, model of mummy, ivory scale and shell compass, chess dice, etc. The museum has a small reference library and a publication counter for selling publications of the Archaeological Monuments. Was longing to see such a collection/recollect these places visited many many years back! No words can appreciate your work.SUPERB! EXCELLENT NARRATION. MADE ME CURIOUS TO VISIT PERSONALLY. CAN WE HAVE A NIGHT OUT AT LOTHAL, LIKE CAMPING? I was there last week and was amazed at the ingenuity and advancement of these people. Their seals and stamps are truly special and worth checking out in the museum. I read your blog today and it's really informative, thanks for the knowledge. Thanks for this very useful and informative article on Lothal. I am intrigued by the jar bearing the story of the thirsty crow. Would like to read more about it. This , truly , a great Record. Very impressive-done with a lot of love , attention to details AND with a great sense of history. Deserves wide circulation; we need to know our past.